In the spirit of upcoming holidays, here's another giveaway! 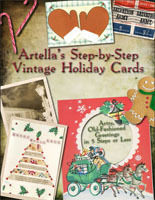 Download a FREE copy of the Artella eBook, Artella's Step-by-Step Vintage Holiday Cards, an eBook featuring 10 beautiful handmade cards, complete with photos and descriptive "how-to" instructions, showcasing a variety of techniques such as rubber stamping, collage, and innovative paper and mixed media arts. Download your copy here! FCC disclaimer: I have an affiliate relationship with Artella, wherein I earn a commission on every sale for Artella eProducts that I refer.